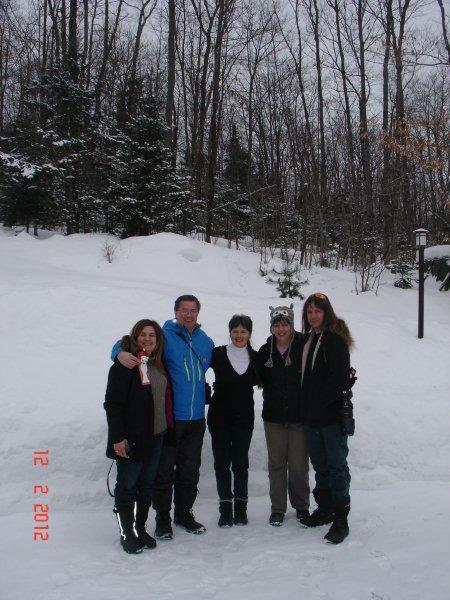 The four of us with our hostess, Rachel, at Fox Lake Bed & Breakfast. 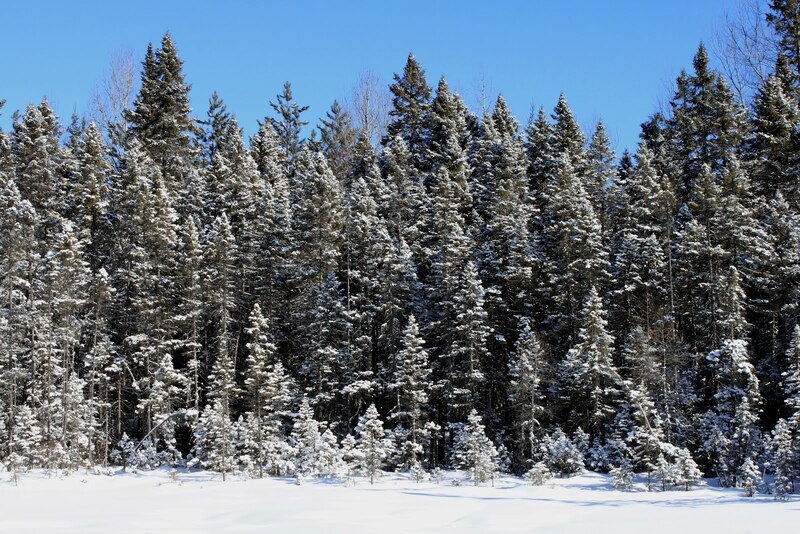 A winter escape to Algonquin Park last weekend with our friends Jim & Lynda for some birding was just what I needed to lift my spirits. We had such a good time we'll probably make it an annual trip. 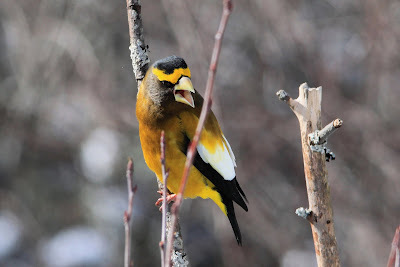 One of the main reasons we wanted to go was to see Evening Grosbeaks, a lifer for 3 of us. They weren't hard to find, a flock of over a 100 were busy at the Visitor Centre feeders. A beautiful male Evening Grosbeak. The females are very pretty too. 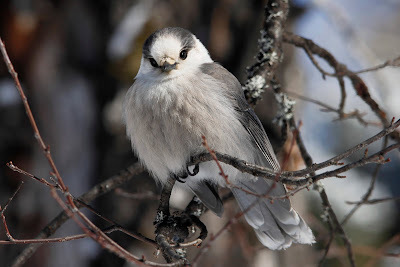 After a good long look at the Grosbeaks, we did some trails where we saw and hand-fed Gray Jays and Chickadees. 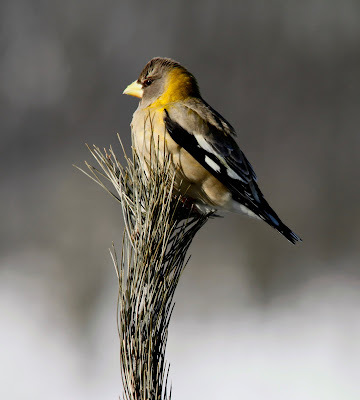 I also had another two lifers with White-winged Crossbills, and Pine Siskins. We also saw Hairy and Downy Woodpeckers and Blue Jays. We enjoyed our time in the park despite the bitter cold. We try to get to Algonquin every winter to see the Gray Jays as they don't come down to where we live. 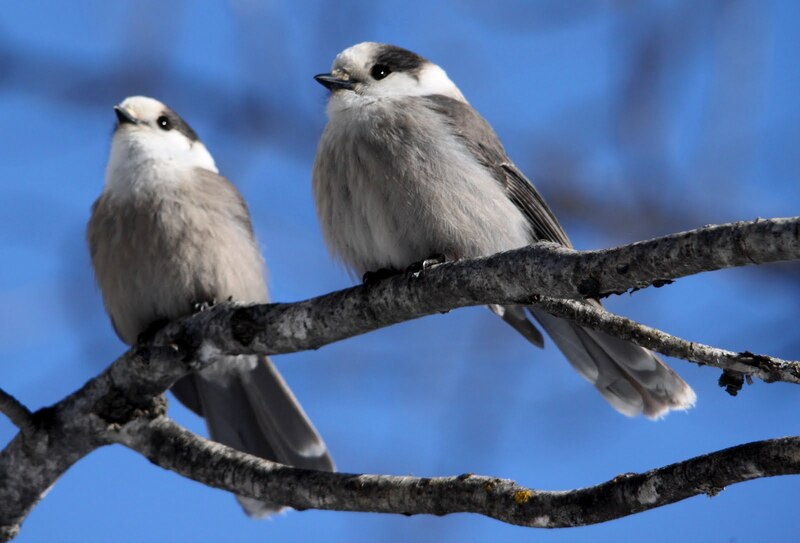 Hand feeding Gray Jays is always a special treat. We see Chickadees almost everywhere we go and it's usually pretty easy to hand feed them in the winter. 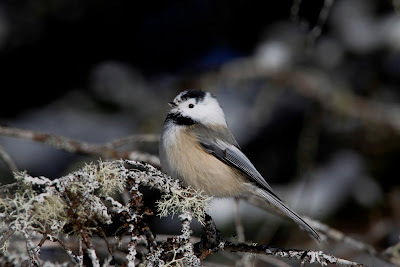 On this day we saw a very unique Chickadee that got us all pretty excited. 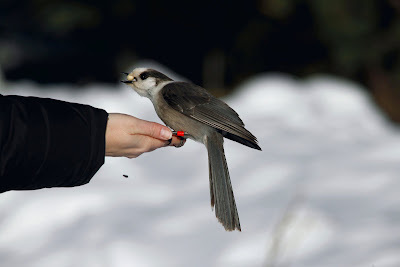 Silly me, hand feeding a Chickadee. 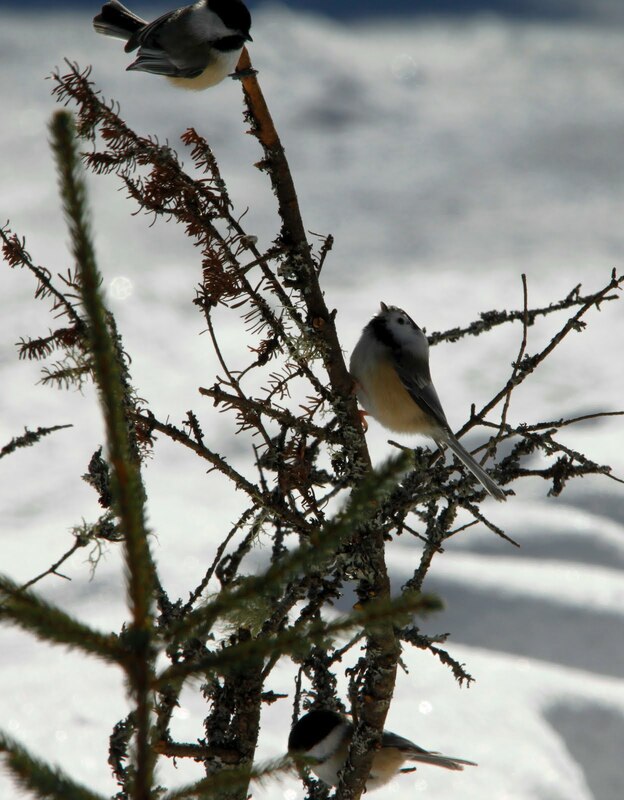 A leucistic Chickadee. (Missing most of the colouring in his face) He was pretty cute, but shy. We all really enjoyed the "winter weather", as Toronto has been pretty mild and not a lot of snow this winter. It was nice to get out and enjoy the snow and cold. 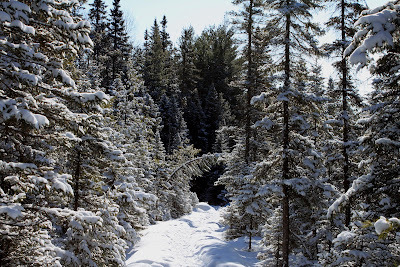 One of the wintery trails we followed. 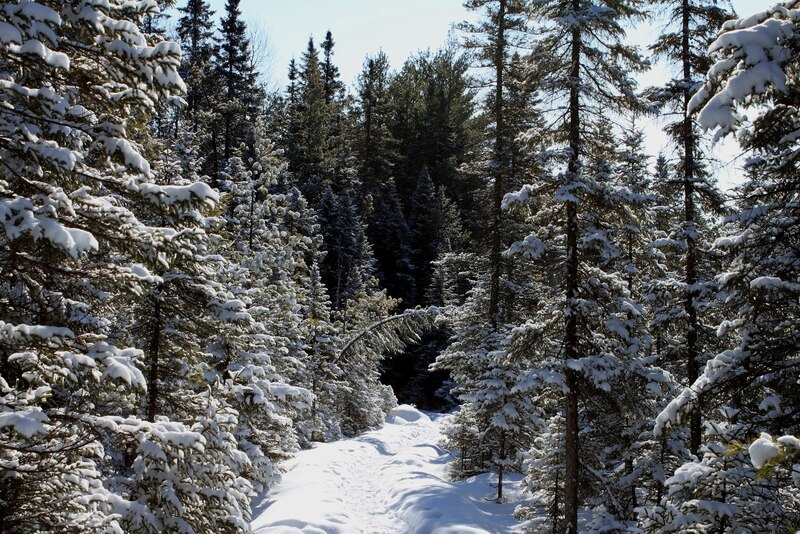 I love this shot of the winter wonderland Rob took. After a great day of birding we headed to our B & B for the night, Fox Lake Bed & Breakfast, in Huntsville. We had pre-arranged to have dinner there and were looking forward to it. Jim & Lynda's room for the night. Rob and Lynda enjoying a drink at the bar. Another part of the sitting area. Where we enjoyed a gourmet 5 course dinner. 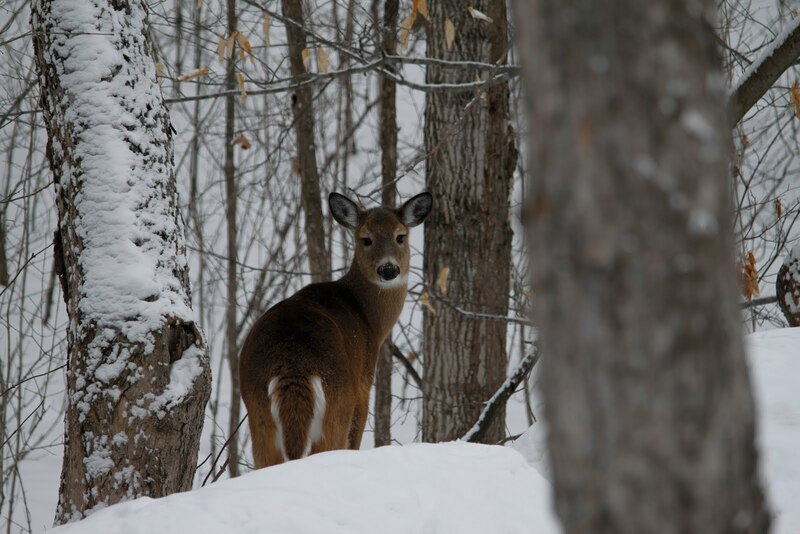 The next morning during breakfast we enjoyed watching a flock of 30+ Blue Jays at their feeders, and also 4 deer. Not often we get to watch deer while having breakfast. Before heading back to the city we made a stop at Arrowhead Provincial Park, but not many birds were around. 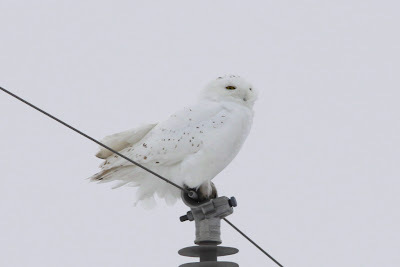 We then decided to stop in Holland Marsh to see if the Snowy Owl was around that Rob and I had seen before, but would be a lifer for Jim and Lynda. After one drive through we didn't see him, but on our way back out, there he was in all his gorgeous glory sitting atop a light post for us. It was a great way to end a great weekend. A gorgeous male Snowy Owl. Seeing the Snowy Owl was the perfect way to end a great weekend. For more of Rob's bird photo's from this trip, please have a look at out new "Birding Blog". Great photos especially the birds. Thankks for th eblog comment. Winter hasn't been too bad here. What a memorable weekend to share with friends. 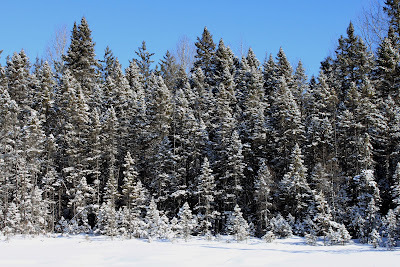 Seems we have to head there to find some snow for our snowshoes.